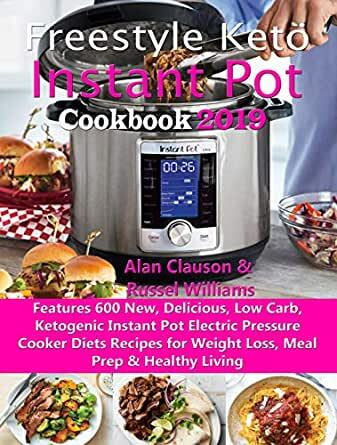 Freestyle Keto Instant Pot Cookbook 2019 Teaches 600 New, Delicious, Low Carb, Ketogenic Instant Pot Pressure Cooker Diets Recipes for Weight Loss, Meal Prep & Healthy Living that suit different Keto lifestyles including Vegans and Vegetarians, Weight Watchers (Gluten Free and Low Carb Recipes) and other lifestyles for moms and Chefs. If you have been looking for Ketogenic low food point recipes to cook daily that take less than 30 minutes to prepare and cook and also require less number of ingredients, mostly 5 ingredient or less to cook in your instant pot, then this cookbook is for you. You will find how to easily calculate the food points of any meal in this cookbook. Are you new to keto or Do you need tips to start meal prepping? This cookbook will walk you through the Keto make ahead recipe steps. Instant Pot Beginner Tips – How to master the function buttons, First time usage tips, Safety and maintenance tips, etc. Just make the right decision now and enjoy these 600 new, healthy instant pot low carb ketogenic freestyle and flex recipes to help you slim down fast. This book is not just a cookbook, but is also a health guide you need. 5.0 out of 5 starsExcellent purchase! This is a really good cookbook. I understand how to use the Instant Pot much better now. Good job of explaining and recipes are good too. Only tried a couple of recipes so far, but the step-by-step instructions have been very clear and easy to follow, helping me build up the confidence to actually use my instant pot. And recipes have worked out great!!! End products have been healthy and delicious, and look like the nice photos in the book. I would recommend this cookbook to anyone with an instant pot. Very informative book! The recipe for brown-butter steel cut oats alone is worth the price, but there's so much more. Besides recipes, there is information about the Instant Pot itself, recommended tools/accessories, and how to convert recipes. What I love most in this ketogenic weight loss cookbook is how simple and concise the recipe steps were made. The few keto vegan and vegetarian instant pot recipes I tried out were delicious and easy to make. I will try out more as time goes on. Thanks to Alan and Russel! The keto meal prep beginner tips were very helpful to me as a beginner. Also the recipes are delicious and easy to prepare and cook. The ketogenic freestyle snacks and desserts are really helping me to control my keto food craving habit.